– Welcome everyone, this is Bálint from chatbottutorial.com and today I’m going to interview two persons, two amazing persons who established the company called Botcopy and they are talking about the challenges, the design aspects and the copywriting aspects of creating a good experience for your chatbot. So please guys introduce yourselves in a couple of sentences and welcome to the show. 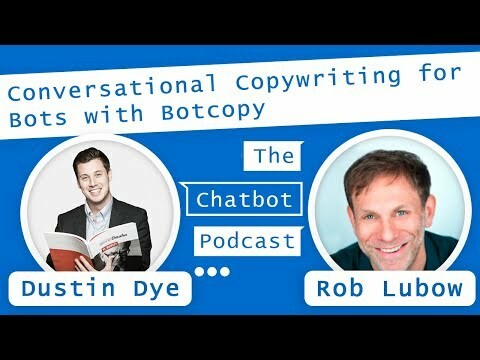 – I’m Rob Lubow, I’m a creative copywriter and a creative director and the co-founder of Botcopy, also a founder of CopyRevision.com. – Sounds amazing. So you have a great overview over the start-ups and you see how you can help them with a new insight of their copy in the bot space, right? – Yeah, so I’ve been with Expert Dojo since the beginning of the accelerator and we are taking on about a hundred different start-up companies now. And in doing so we go through every stage when everybody comes in and at different stages, so it’s fun but is also allows me to really see interesting use cases for bots, in every bot you can have a different use case, an objective, you know, where when people like Swell, when he first came in to Expert Dojo, you know. I met Peter about a year and a half ago and he came in, he just had an application, and they were kind of introducing us to the bot space and how they were thinking about switching the whole business of the bots. It was really the first time I’ve been introduced to the bot space, so I started doing a lot of research and seeing that that was a good idea, because there we had 30.000 users. In the beginning of their app that has just been launched for 3 or 4 months. I think it was like the Austrian Shark Tank or something like that in the beginning, we were doing some fascinating things, and as an accelerator, you know, just feel like a usual mood to jump ships into the bot space. So as soon as I started doing some research and saw it’s kind of like just this new land of opportunity for start-ups to really take over existing platforms like Facebook where there were, you know, already billions of people using and then you could think that ok, we have this app and you can launch your app in the App Store and you can compete like with most other start-up companies your business is in the App Store and they’re paying, you know on an average 5 to 7 dollars to acquire a user. But we all have in the use, you know, very few applications in our phones. I think on average it’s like 6. And there’s also millions of other apps that are competing within the App Store. So it’s kind of a difficult game. It’s a risky game. Most are at a risk with the failure rate and at least in California alone is 90% failure rate and then to jump on and try to compete with other apps and something like that, it’s difficult. So when I saw that there’s this open opportunity in the bot space, we can leverage these platforms where a ton of users already exists, then it’s actually really cool. So we started working with Swell and not only on their business, but how to design this conversation and build the personality of a bot and how to really engage with their users and create this just fun loving whale experience. And I let Rob talk a little bit more about, you know, building personalities. But just in the beginning how interesting it was to see a start-up that was growing slowly and paying a decent amount of money for users in the App Store that switched over the whole business to the bot space, like Swelly did. And now they are growing it like 30 to 50 thousand users a day with, you know, a fraction of the cost per user, I think it’s less than like 10 cents per user right now, which is really, really exciting to me, and one of the reasons I really wanted to focus on the bot space. – Amazing. So, Rob, you have a unique website with the CopyRevision.com. It’s also like in a bit interactive, at least more interactive than most of the websites. Can you talk about this business a bit? – You know, in the past few years content marketing and written content have exploded. We have a lot of businesses that we want to proceed as thought leaders and one really good way to do that is with plugging and publishing articles in high-profile, places or long-form articles and medium and so forth. It’s hard to do when you’ve got visionary leaders, you know, trying to convey complex ideas, they are not always the best writers. So thinking was having work of lots of founders and visionaries in the past is the best way that happened. You know, we could create some great writing, while instead of someone like myself, who is a professional schooled writer interviewing them and trying to pull the information out and then constructing something afterwards, it was often more efficient to have them write a very bad rough draft. And so I asked them to write the worst, you know, get your ideas on the page but don’t worry about the writing quality. I can intuit what you’re going for and then I can kind of spin it into shape. And that way we can get it out tomorrow instead of a month from now. And many times it was confirmed that it works. So I thought why not set up a company that does only that and pull some of the best writers, the best journalist I can find, you know. I had an editor from People Magazine, I’ve had some, you know, Harvard graduates and just fantastic journalists working behind the scenes of CopyRevision and we’ve received, you know, hundreds of rough drafts from different founders who wanted to convey their ideas and we were able to spin them into clear concise and upbeat messaging for all channels and it’s been a really fun ride, a great way to meet lots of start-ups and see where what kind of solutions they are providing. And by the way, it’s a fantastic lead-in to Botcopy, because after writing in so many different voices, and wearing so many different hats, now we can really very gracefully step into the role of [ups, sorry]for any kind of bot, whether it’s a little while or a little alien, or it’s Alexa. We can kind of study the voice patterns and the Tone and the Vibe. As well as integrating that with serious sales goals and conversion rates and really trying to create elegant, logical conversational design that will get results, it’s the marriage of both worlds. So CopyRevision is a great little business, great little service and a great lead-in to something like Botcopy, which I think is going to really help as AI explodes in the next year or two. – Yeah, I think so as well, because of the changing, like there’s a text, there’s an idea but it has to be tweaked in a way that it’s more engaging. So what was your first bot experience, Rob? – I was in the room working where Swelly was being discussed and you know, Yala on Slack, one of the leading bots, was the first real, not the first bot experience, but the first one where we could really see a dramatic improvement on day one of deployment. So we’re taking rough draft scripts sometimes, like in the same pattern as I was doing with CopyRevision and looking in what they are trying to do, but changing the verbiage, the tone, the personality and the style and then, you know, also with Dustin’s strategic ability to grow start-ups and to understand what the conversion points should be. We were able to remap the conversation, deploy it and see on day one, looking at Mixpanel, data the kinds of informatic improvement we can hope for. Now that’s not to say that the conversation wasn’t, you know, up to speed it was a pretty strong conversation when we first got it, but we were able to build in some new things that got over some hums. – So in the digital world, as the main places where people need copywriting are the websites and probably the email marketing, right? And I see now the bot space emerging in that as well as a marketing channel. What are some of the adjustments that you see, guys, that people probably don’t make or should take into consideration when they change their communication channel into the chat applications? – I think every medium that we do marketing on has the different message in a different way we delivered our messages. You know, just as our message on Twitter would be different than our message on Facebook. Now, well, I think today we’re in this era there’s always different platforms when we are sketching on the fact that how we would leverage these social platforms, like Facebook, and deploy something like a bot and to me you can look at it like one size fits all or stop, like take a look at Swell, because it’s a perfect example. So Swell isn’t just on Facebook Messenger. Swell isn’t just a bot. It’s also an application. But they are using, they are like spreading their arms. And whether you call them marketing funnels or different messages or whatnot, like they are on Line, on Kik, on WhatsApp, on Facebook, they have an application in the App Store, they have their own Facebook page, they have an Instagram funnel. These are all different marketing channels. And the way the bot delivers a message is almost a word of mouth, it’s almost like a friend telling you that this product is worth buying into, if you build the right personality. And that’s why I think something like Botcopy is so fascinating. It’s because, you know, how can we convey these messages to be like the trustworthy companion of a bot that also simultaneously markets your business. And if we can do that in a really perfect transition of gaining credibility as a bot and then trust as a bot, and then also have a fan experience with people wanting to keep coming back and using that, I think it’s a really interesting marketing message and extremely effective for businesses. So how you use that message and how you deploy it, it totally depends on your brand and who you are, and what objectives your business is trying to do. So you could be an informational bot where you want to gain credibility as a thought leader in your space, which helps your brand. You could be a market research bot, where you want to help brands like Swelly just to make a decision between A and B. You could be a social media assistant, like Yala, and really help your day at work and the marketing behind that is just more of hey I’m a free intern almost that’s going to scrape all your social accounts and say: here is where your audience is the most active, please upload a post and obviously blasted up for you. So there’s all these different use cases that are emerging for the one marketing aspect of a bot, but also ways to create like fun trustworthy companions and you know, really take off. And I think as AI grows, I think we are in this early kind of embryo stage of artificial intelligence for most bots … today like Zest, like Neat, something like Botcopy, whether it’s us or someone else doing the bot and actual writing their scripts of conversation, how they want to cater that, whether it’s a marketing message or an objective or a service, or even selling a product. It’s just easy to be thought out and eventually I think that there will be bots that the AI kind of learns what users are saying, how they’re interacting, what retention, what messages, you can A/ B test through the bot or converting hire and will be deployed but, you know, for now it’s a thought in the script, in building that personality and how you want to deploy that message. So that’s where we found this kind of little niche where I think in the past 5 to 10 years most app developers of your businesses were so focused on the user experience being within touch feel and like small words that are more like Call-to-actions, where now it’s all based within the bot space on conversation where yes, Facebook and all the other apps are launching new features almost every day that allows pictures and ability to purchase products within the app and all that stuff, but it’s still, you know, the linear conversation is just like you would with a friend, which is just amazing and fascinating. – For me some of the things that are very exciting about the bots are that you can make these small stops and get feedback what people do, what action they do. It’s one of the things that you cannot really do on websites for example. And one of the copywriting concepts is that you should join the conversation of your reader. It seems like bots enable this in a way, because you can get these little chunks of feedback. What are your thoughts on that? – I will give it two perspectives. So in Expert Dojo when I’m working with start-ups, one of the biggest things that we kind to focus on in the beginning is your customer profiles and user experience within your product to match those customers. So if your customer is an 18-year-old woman, then her experience on a website, or using your physical product or whatever is going to be different than an 18-year-old man. And that’s pretty obvious. But the thing that’s really interesting about bots is instead of making these like guesses or having surveys where 20 people, you know, filling out. We’re having one-on-one data and conversation with every interaction that we have. So the ability to learn from those specific points and … collections that we on the backend or the bot can read is maybe one of the most elaborate customer experience based on actual customers interacting with your bot and we are learning from it. So I think from that one standpoint, like just the testing aspect alone is developing and catering in and allows us to really touch and affect the people that are using our platform and give them the experience that they desire. – Well, the original question had something to do with joining the conversation with your market and how chatbots allow us to do that even more than other channels. Is that kind of the spirit of your question? Is that what you’re curious about? – From a writer’s standpoint you’re always trying to empathise with the reader and there’s a lot of guesswork. So you’ve got a couple different models in your mind of who that advertiser is, who you are talking to and you write the headline, then you write the first sentence and by the time you get passed the first paragraph, you have to assume that you’ve lost a certain percentage of your reader. You do the best you can. You’re trying to guess what they are feeling and thinking and trying to anticipate that. And then you get to the second paragraph. You’re hoping you still have your readers and might not. By the time you get to the end, you see maybe there’s a certain amount that it resonated with and a certain amount that felt this is not meeting my needs, I’m going to move on and listen to another content. With conversational design you’re providing options. So I would say fewer readers will jump ship completely. You might after the first paragraph of say a blogpost that is now being expressed as a convo, you can give them choices to say hey, you know, I hear what you’re saying but I’m more curious about this aspect rather than that aspect. So you could say now that I’ve said the first paragraph of my post, you know, what you want to know more about, you could say something like tell me more or now I want to hear about this instead, etc. So you’re giving them conditional response options and then they can decide where the conversation goes. This is one of many examples where as a writer that burden of like having yes pi, like what is my reader wants to know, where they want to take this conversation. I have less of that burden and the control as more and the users’ hands, which is a fantastic thing. – Amazing. One of the key things about chatbots that I hear is that it has to have a corrector. Do you think it’s always the case, or are there exceptions, where it’s like, ok, the bot doesn’t have a name, a personality, just this whole charisma around it? – Dustin you had a fantastic inside about that: ok google the other every day. I think we see bots that have characters and names, that are personable and a little bit fun, tended to do better than bots that are more generic. – Yeah, I totally agree. I think the experience that most people want to have is not a robot. No, they don’t want to feel like they are talking to the wall. Like in aspects like the same thing back… you want to feel that this personality is kind of like learning and understands like the pain points that we have, so the previous conversation we had with it. So I give this rant. And I gave this rent in this blogpost of the launching later this week about “Ok Google”. Now the word “Ok Google” … we kind are really into it but it’s just that Google really needs brand recognition at this point for us to commend their bot like saying Google. No, I just think it’s a weird play when you take Apple which has Siri, which is a personality and then you take Amazon, which has Alexa. Then Ok Google comes to the market was Ok Google, which is just kind of a mouthful so to say in the first place, like the word Ok Google, it’s just like not fun to say, like try saying it ten times fast. It just doesn’t work. At least from my standpoint, because I’ve had both Galaxy and Apple phones and have used Ok Google as a personal assistant before. Well, the functionalities are amazing with Google. It’s a Google product. with all of Google’s functionalities and does well. But just the negative connotations that I’ve had along it like summoning the bot, which is just, I don’t like it. It’s not as Siri, it’s not fun. I don’t feel like building a relationship here, I feel like I’m just giving information. That’s just my prerequisite.. to a bot or a brand that are boring. I know that they have their personal use cases, but as far as like building a relationship and really understanding the user’s personality and charisma is key. – Well, one thing we try to focus on is personality and unique aspects of your bot. So for anyone who is looking again in the bot space: what do you want? More sign-ups or more sales or just to give more information in a creative way through a conversational UI? A lot of attention we believe should be paid to setting up a unique persona and a personality and that’s not so simple to do. You know, if you’re not a creative type, if you’re a coder, or a business person, or a more traditional marketing person, you really have to get creative and have fun with it. Because if your bot is unique, you have a chance to bond emotionally. One example that everyone likes to uses is Poncho, the weather bot. You can come up with a million ways to have a weather bot, you can have a weather bot called Weather Bot. Would you want to get weather from Weather Bot or Poncho, a cat wearing a rain coat, who talks about pizza, or whatever and kind of like a little cat who’s like your buddy? Most people at the end of the day want to have a little bit of fun, you know, life is hard and work can be a grind and any opportunity to get a little bit of light-hearted feeling in your life and, you know, people grab that and when you create a unique personality in the persona, you’re giving your bot that actually edge to beat out the hundred other bots in your category who feel more generic. So that unique personality is a really hugely important part of penetrating the market with your bot. – Probably also like it’s a little mini storytelling in a way that the bot has a personality and it can be shared more to people, like imagine people talk about, yeah, there’s this weather bot that tells you the weather, or there’s this little funny thing and yeah, it’s called Poncho and can tell you the weather. – I also would like to mention Swelly, because that’s a really interesting one. It could’ve easily just been a functionality and more focused on choose A or B, but the fact that it’s branded as a whale allows us to bring in all kinds of interesting nautical verbiage and puns, which keeps it different and it’s not that it’s the goal is to be funny or entertaining the goal is to be distinctive, so people remember your brand and hold it apart from all the other brands. So whether you use a whale, or a cat or something like that, it’s important to try to figure out who you are, what your brand represents and what’s the best way to express it. And we see that rather than having a person, an actual human being, like me or something, or the name of the company, like Google. There’s anything in between them, like a little anthropomorphic creature, you know, seems to promote better from all we’ve seen. – What would you suggest for people who want to have a bot for a coaching business or like a marketer or an entrepreneur? – I think there’s a lot of hype in the bot space right now and the most part is good hype but it’s also just having people jump on it before they really think about the use case of their business, which is never good. You know, you shouldn’t just jump to markets whitout thinking about your objectives, what the bot’s going to do, the functionalities you have, so it’s an approaching aspect and you have to think like ok, whom I’m going to provide this and what those people look like. And predicate a conversation around them. If it’s a personal trainer, you know, coach, where it’s a workout program then it’s going to be different and if it’s a personal trainer for a certain age group, then that conversation is also going to be different… But if you want to learn to … about the user, then you also have to gain… trust and stability. We kind of have this thing when we start with different companies about the art of the conversation, where similar to most customer journey, we like to … a little bit of persuasion and sales … as well. So where a lot of customers are going to go along with your business where you start with the learning, you know, they have knowledge, motivation, they purchase, they become a loyal customer and then they create advocacy, which in the bot space we kind of calling … earlier sharing. So we like to understand basic objectives for the bot to take? And then if it’s something like a coach, we need to gain awareness and credibility… what do you need coaching for, allow them to have different options, so our options are… you know, what kind of exercise, what part of the body, what you want to be focusing on with this workout program. Maybe they say I need to lose weight and whatever part of their body. They also are like points of collection but also giving the users options. And they feel like they have a little bit of sake, which in the meantime makes them more involved and at a certain point, they say as well, I’ve already made it this far, I might as well see what this bot has to offer me. So these are all different things that you have to think about the objective that we set for … approaching bot, a business, a marketing funnel … whatever the use case be and how do we get to a point where they want to keep using it, so retention and then also share to the other. Hope that makes sense. – It does. Balint, when you asked the question about coaching, what did you have in mind? Can you give us a specific role? – Yes, probably the fitness coach would be a good example, so like an individual who has a business and wants to run his bot as a marketing funnel/a channel to communicate with existing customers. – I agree with everything Dustin said, I guess the only thing I would add is what your coach, you know, your product is a conversation between you and your customer. So the bot’s function primarily would be to facilitate that goal which is to have the real conversation. So to give them a little taste of the kind of sensibility you bring to interaction, but then they quickly set up a consultation would be the goal. And there are ways to do that, to remove the kind of drag that would get in the way of setting up a consultation. – And when if it’s not a bot that says: we are going to do the workout, we don’t need the bot now and you want to use this more of marketing and sales funnel, then it’s a different pitch. I also tell people when they ask me, that I like real estate, because I have a little bit of background of real estate as well and I understand the sales model between real estate. I was working with someone on, who was like you know I want to create a better sales funnel for real estate using a bot, how do I do that? And I told them ok, you want to make it differently to understand really what works, record every sales call that you have and take notes. And the ones that convert successfully let’s study and see why they are converting, what tones or voice you used, how you used them to experience that, what you said specifically that made them want to buy your product, and let’s automate that whole process. So let’s turn what you said that was successful into a bot that learns your user. Maybe it was the specific things that you said and you take in to the real estate function is how many bedrooms would you like? Giving them options. Like I was saying to here before. Instead of just telling them, pointing them to a direction, which a lot of bots today. Like, have this linear funnel-like let’s go down this path because this path we have to go down. But when you give your users options like hey what bedrooms would you like to live in? We want to understand and you’re in our best interest, so where do you want your kids to go to school, school districts. Something that you’re interested. Now these different conversational tries, they’re still wrapping us into our main objective and once we find the most successful case point, and we can implement different trees of conversation to still funnel us back into a sale, a retention, a happy customer, a brand awareness, a … So really studying what works in your business like remotely and being able to automate that whole process is another kind of really good way to go about it. – You briefly mentioned some of the things that bots are good for testing, like you get some short feedback very quickly. There’s this concept that’s called Wizard of Oz, when the user doesn’t know that on the other side there are humans talking to them and they think they are talking to the software, to the bot. What are your thoughts about that? Did you try this out? Would you recommend it to people? – So is the question how to have your bot communicate as a robot or that the people don’t know that they are communicating with this like robot, or? – So I’ve heard about the hybrid approach of having people dive in in the middle of the conversation and take over for the bot without the user really knowing for sure if they are talking to a bot or a person. I think it’s always great to let the user know exactly what’s going on, I think we owe that to our user and say: hey I’m jumping in here, you’re not speaking to a bot anymore, this is Rob, I’m here to help you or answer any of your questions. I’ve read some case studies about that. I think that’s great if you have the power to do that, if you have enough time to do that. The whole point of the bot is that you don’t have a million selves to do the talk to a million people, so you have to put the bot out there and let it do its job. But if you could clone yourself in million times, then we wouldn’t need bots, I think, it would be even better. – What I really meant is I don’t want to trick people and hold them that they are talking to a bot and not a human. Actually most people prefer humans, I guess, but as a way of testing things out before you complete the whole automatization just to have a feel and feedback about what people would take the conversation without you restricting them or the bot trying to answer some of the questions. – Yes, so I think that bot use cases are new. Well chatbots might be still young, for like 5, 10 years we’ve been calling you know corporate companies then before we get to where we want to be, we’re filtered to this robot. And while somebody’s conversations are annoying or kind of frustrating or it would go like go and press 2 if you want to speak in German or English or Spanish then you get to the person that you needed to, but I think at the same time it’s a little more efficient. That’s why they exist. So we were talking to 10 people that are actually running their corporate office in that given area then process would actually be a little slower. So the conversations that we have with robots I think we are all accepted and comfortable with it and I think we just want them always to be better, faster, stronger. And if you can add more of a personal given touch to it, then the experience is just like better for all users. – One of the keys of the success of Swelly’s getting people back to use the application or the bot or whatever platform we are talking about. So what were the key elements that you could improve the engagement rate or the retention in a way? – Well, when I first was working with Fred, Swell’s COO, we took a look at the original scripts and we didn’t really have much personality and we had this little whale logo and it was fun and playful, but the messages were like no tutorial around onboarding, no branded personality would come. So when people understood how to use it they were just thinking about to upload picture A, upload picture B, and let people make decisions. While if you create this like credibility and trust in the persona like saying hey, I’m Swelly, a wild whale from the deep of the sea, here to help you make decisions by collecting other people’s opinions. We kind of have this like initial oh, this is what you do why I should trust you. And then you create this other branded content like whale … or … logo and that’s just fun that people might be of little small changes but has this personality that helps kick off the conversation. – One of the things I noticed is that there’s an option to skip voting, so there’s not just A or B, but you can skip it. Was it always like that or was it a small adjustment to help people that they are stopped on certain pictures or topics? – Yeah, I’m not positive that it was always like that, it’s been like that for a while, we are trying to encourage people to upload better quality pictures. So if you keep getting your picture skipped then it won’t reach as many people. So it encourages the users to upload better pictures because if they have a platform in a bot that has beautiful pictures and a good experience for the users as well, that’s hopefully not only them but everybody use it. – Ok. One of the key differences if we look at bot as a marketing funnel, as a messenger marketing e.g., vs. e-mail that you have to chunk your text. It doesn’t work on messenger that can work on e-mail and as Rob you said, like the paragraph and then the next paragraph, and the next paragraph. So in a way in the bot you have to put these hooks and little call to actions in there. What are the key concepts that help you create these hook points? Can someone just copy-paste an e-mail and just chunk it, or what are the adjustments e.g., from an original e-mail? – So to take the content from an e-mail and adapt it to a bot format, it’s so I would imagine a typical e-mail has some short paragraphs and at the end of each paragraph there’s some kind of call to action or link, correct? So if you are talking about that a kind of e-mail, let’s suppose a newsletter and so kinds of e-mails. You take those conversion goals, you start with those, just have a clear new mind what you are trying to get your user to do and then you walk them through it in a conversational way as opposed to a one-way communication, which is e-mail. But the hook points tend to stay in the same order and at the same place. The only difference is that the user can decide to skip around. So if there’s like the fourth conversion in a newsletter, might move up to be the second one in a bot conversation depending on what the user chooses. – Ok, thank you. What general tips would you give to people starting to design their bots, whether they should look in more, like what are the things about the communication and this two-way communication that are bigger, or like more emphasised, in contrary to the traditional one-way communication? Are there at all these things that people think ok, this thing is way more important than on a website? – There are so many ways to use conversational interface. We are really fortunate to work with Yala and Swelly. And Yala for instance is an app that allows you to post social. And the choice to do that with the bot was a great idea in their part. And they know that the convo has to be creative and they know full well and they are capable, very bright people behind these apps, Swell and Yala. And creating the conversational design is so iterative. You have to try things and see how people respond but sometimes people aren’t doing an app, they are doing educational thing, like they want to listen to some content, they want to put a blog post up there but they want to do it conversationally to keep people more engaged. That’s not really a tool that they are promoting, they are promoting ideas. You can use a bot to promote ideas, you can use a bot to express the use of a tool, you can use a bot to drive conversions to your business. And each of these cases, you know, a bot is just another channel to try. Except in the case of the app, the bot becomes the app. That’s the one situation where a business is needs to think long and hard about what they want to have, a traditional UI, or a bot be the guts and nuts involved with their tool, about the solution they are providing. – I know that you prepare a voice bot, where there’s another element of the conversation that in a written text you cannot see that what tone of voice someone uses in conversation via voice it’s more complex. What would you say about someone thinking about creating a voice bot? What are the good ideas to collect? – Well, we are working with some, we had clients who are working on Alexa, so regardless of the kind of messaging or tone, or vibe they are trying to convey through their brand, it’s going through Alexa’s voice and she’s the ambassador, the person sending between this brand and the user. And that’s fine, because we can choose, you can convey personality and brand through the word you choose and not the tone of voice. But in terms of moving towards voice chat, I like Dustin fill that, because that’s he really has a huge interest in that. I don’t know Dustin, we were talking the other day about how it’s going to all move to voice, it’s possible that it could all move to voice very quickly, and his question was about what we would advise to people who are looking at maybe doing a voice interface, instead of a text interface. – Yes, so I think bots are successful because the frictionless communication and use cases. The quicker the process is around an idea or perception of something, the purchase, the better the business typically is. So if we have 1 to 20 steps in the application. From thinking about to actually purchasing and using the idea, which takes about 15-20 steps. That’s from thinking about that, going to the App Store, downloading it, waiting for it to download, opening it, waiting for other people on there, navigating through it. Where it becomes really a thing is now can we have these voice communications in enough areas, where approaching that conversation is enhanced. Or now we are just talking to those. We don’t even have to touch our phones. So if we eventually were, you know, you have Alexa where there are coming out with the Echos, you put it in all of your house. But when that conversation comes in your earbuds or anything. We are just walking and just summon that like personal assistant robots with their voice, and this going to be an extremely powerful tool. But the use cases aren’t quite there yet… Well, Alexa has deployed a 100 million dollar fund to developers to start enhancing these features and it isn’t quite there yet. Which is the reason why chatbots can do that well. Because from applications to bot it’s 3 to 5 steps instead of 20. So they are performing higher. Where with voice, if it would be just 1 or 2 steps. Fascinating to me. In a way, I see a huge push of movement and a lot of potential. – Yes, I’m also really fascinated about the voice interfaces because so many times people are just on the road or doing something and they cannot actively take the time to type. So it’s a good complement situation where people cannot really talk because they are in a noisy environment, or I don’t know, it’s just not applicable. – No, Viv is the software they acquired, by Siri founders which is fascinating, that’s a whole podcast topic on it’s own, how the founders of Siri sold to Apple, then 10 years later built a new and bigger, better and enhanced software. But I think they changed the name and … in China to test the market. So we’ll see how Samsung comes against in that aspect. All these powerhouses are creating platforms similar to how Facebook does with their developer conferences, and encourages like people to develop new technology and features on Facebook and kind of acquire or think they can just have it for the community’s using. So if the voice can be in enough places and it becomes acceptable to wear an earbud, all around, then voice is going to take on, and it can be a really cool feature. And if not, like until then texting and having instant access to a bot or persona or personal assistant or marketing guru or information, specialist, sportstar, sport news, whatever the bot use case is, we still have a better experience right now, because of the 1 to 5 steps and it takes compared to an app, where you have to download, open, etc. – It’s true that we have two voices that we know right now, in AI we have Siri and Alexa. And you can choose which person you’d like to talk to, it can be a woman with an English accent or it can be a man. What happens when we have thousands of voices out there each representing a different brand, style and personality? Dustin, do you see a world where we have just hundreds and thousands of funny different kinds of voices expressing all the different brands instead of having them flow through 5 or 10 main voices? Because I could be crazy. And when right now you look at the ikons in the chat, and the little avatars of the chat, bots we use, people like Poncho. Like what is Poncho’s voice? What is Poncho actually in the sound like if he starts talking? And are we going to have thousands of different voices? – Wow, that’s interesting. Because we have such a variation in the actual look of the characters we are dealing with, like you’ve got Swelly, you’ve got Yala and Poncho. But then you’re saying the voices would be more a set thing, like a fund set, versus the distinctiveness of the characters. I think we spend so much time sitting, looking at our iPhones that we read a lot more than we need to listen to audio, like being on the go and there’s a writer I know that, when you don’t hear the writer’s voice, you actually like the writer more, because you interpret their voice in your head as something like super identifiable. Think of your favourite writer before you’ve ever heard them talk, you had this idealized version of the voice they were using and you loved it. And then you hear them talk and it’s kind of ruining the reading experience because now you’re thinking of their voice and it’s not what you’ve imagined in your head. So when you’re writing copy or bot copy, you have this opportunity to be more universally likeable. If you don’t have a voice temper, so you get to be whatever the person really wants you to be. So I do like that aspect of writing and because I think we’re sitting around most the time stationery looking at our phones rather than driving. And I think even with automated driving you don’t really have to look out of the window anymore, you can kind of look down at your phone in years to come. We might stick with writing text more than we think we will. So more to how video chat, like we are doing now, really hasn’t taken up the way I thought it would when I heard about it 10 or 20 years ago, because a lot of times people just like texting on their phones, something more satisfying about it. Like I don’t face time with my mom as much as you think I would. She lives in Chicago and I’m in Los Angeles. We text a lot more. It will be interesting to see how it goes. – So I think that’s also part of this reason. And coming to the voice idea, I think when the machine learning an artificial intelligence gets to the level that’s you could just upload all the voice samples of someone. For example let it be a person bot: Elon Musk and you can just upload all his speeches and then it retrieves the data and the voice patterns and all the style and then creates its voice. Then it can be like spread all the variation of bots’ voices. – Yes, they actually just came out last week with that. I read something about that. I will try to find it. – Ok, cool. One last question would be. What would you recommend for people to design their bots? Are there any tools? I know about some people use Draw.io or Botsociety or ChatMap or whatever. What do you use, or what would you suggest? – In the beginning a whiteboard. Like really sketch it out, for you spend time and thought into designing on your web interface or anything, or even are like punching in thoughts, like sit down or write map out of this conversation … Something as simple as a whiteboard. I’ve been using realtimeboard.com, because it allows us to go in different environments or workplaces, who have the same whiteboard interface and just kind of brainstorm, to a point where we really understand where the objectives are in the bot and then take it from there. But actually then I like Rive(script), that’s nice, I think Octaine is ok, I’m not like the huge fan of it to be honest, though it’s … Facebook starting to develop and deploy its own use cases actually for writing them. There’s also another really easy one, … There are several kinds of tools out there to start writing the conversation but my suggestion is just like really think about your personality, brand, where you want the conversation to go, and how many different conversational trees and where you want these trees to kind of lead to before you really get started. – Ok, amazing, thank you. – Did you mention ManyChat? – Yeah, ManyChat is one as well. – Thank you. We are coming to the end of the interview. Do you have anything else to add as a quick tip for designing the copy of the chatbot? – Yeah, give us a call. -A quick tip is think about how you’re different from every other chatbot and every other brand and then the whole thing after that is figuring out how to infuse that difference into your words and sentences so that people know that you’re distinct from everybody else. And there’re lots of creative ways to do that. And that’s why you might need help from a writing agency. – Ok, amazing, thank you. As a last question: who would you nominate as a guest for the podcast and why? You know, some people from the bot space, you see, some interesting bot case. – So I’d nominate … who’s building a bot right now called … Instant, who in my perspective has one of the strongest use cases in the bots that I’ve seen. And he works at Expert Dojo as well at the time. So happy to make that connection. But he’s basically allowing you to merchandise any pictures that you take on your phone, like Polaroid 10.0. – Ok, thank you guys, everyone who wants to contact you, what’s the best way? – Ok, thank you very much. And I think Rob you can also add CopyRevision.com for a clearer copy. – Yeah, for sure, and I would nominate the people at Yala, Gary or Yoav, that’s a fantastic team, and they are trailblazing. These are the bots that have risen to the top very quickly on platforms like Slack and Facebook. The people behind those bots are the ones who are in the trenches making things happen. And again, we’ve been fortunate to work with them and learn from their trial and error and try to help with the best we can. So I would for sure try to get someone who’s actually building a true case in bot on a podcast and they can illuminate so many people with what they know, probably the more than we can. And you can also reach me if you have any questions about how to make your bot convos more creative. Rob at botcopy.com and we can start the convo. – Amazing. Thank you very much and have a nice day. – Yeah, you too. Thanks so much.